DO YOU HAVE THE MASTER?!? Hudson Wisconsin and River Falls Wisconsin homeowners are justifiably proud of their homes and yards. A beautiful yard and landscape is an asset to your property, and when carefully manicured, will be a joy for your family and a remarkable introduction to your home. The amount of time and hard work it takes to create and meticulously maintain that welcoming outdoor space, though, means less time to enjoy the summer with family and friends. 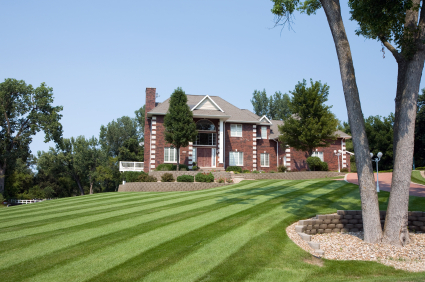 The Boulder Hills Landscaping Company’s grounds management division, Grass Master Lawn Care & Grounds Control, provides Hudson and River Falls homeowners with the utmost in professional lawn care services, at affordable prices, so you can enjoy the season and enjoy your property without spending hours upon hours of back breaking work to achieve it. Contact us today for a free no pressure consultation and let our licensed and insured, experienced and courteous staff serve you with professional grounds care that will enhance and enrich your property! Grass Master, proudly serving Hudson and River Falls with exceptional lawn care and landscape management services! GRASS MASTER is dedicated to outstanding customer satisfaction! We achieve this by delivering an outstanding product through utilizing leading industry practices with top quality products and materials. Grass Master Lawn Care & Grounds Control LLC. Let Grass Master manage your grounds so you can spend your precious time doing what you love to do! Grass Master takes pride in all that we do! And that starts with our character as a company. We have built a reputation within the community as an honest, hard working company that places customer satisfaction as our paramount objective! From initial contact to the last job of the season, Grass Master places quality and professionalism above all else! It will be clear why our residential, and commercial, customers return to us year after year! Understanding the proper times and techniques to properly care for your grounds can be difficult. Grass Master service providers are licensed, knowledgeable and experienced professionals, equipped and prepared to do only what’s right for your property! Your time is precious! Today our lives are busier than ever and finding time to do what we love to do can be a real challenge! Let Grass Master take the stress and time required to care for your grounds out of your schedule so you have more time available for what you really want to be doing!! Lawn care and grounds maintenance is very hard work! Why spend a day a week breaking your back just to be sore the next day? Enjoy your life and let Grass Master do the hard work for you! The proper tools and equipment to efficiently and effectively produce the results you want to see on your property can be expensive and challenging to operate. Grass Master uses only state-of-the-art equipment, operated by trained professionals, to ensure that every job is done properly and efficiently! Grass Master is proud to offer affordable services to our customers. We offer customizable plans to fit your needs and budget and, unlike some service providers, we pledge to never attempt to sell you services that you do not need.